The election takes place during uncertain economic times. The Argentine economy grew spectacularly from 2003 (the year after the default) to 2011, including a speedy recovery from the global economic crisis in 2008-9. However, since then the economy has basically stagnated, and inflation has been high. As a result, real wages—which grew fast during the boom years, leading to a reduction of inequality—have now essentially stagnated. And that probably explains to some degree Macri’s rise in the polls and the surprising tight race in the first round of the election. Growth was possible because the government renegotiated the external debt with almost 93% of bondholders, which allowed reducing spending on debt service, and also due to the boom in commodity prices. But it was the expansion of domestic demand, pushed by both an increase in government expenditures and a reduction of poverty and inequality (resulting from higher average wages, fiscal transfers, and a more comprehensive welfare system) that explained growth. The good export performance allowed growth to take place without external problems. Now the collapse of commodity prices and the continuing problems with the holdouts from the debt renegotiation, including the infamous Vulture Funds, have made the external situation more critical. There are no simple solutions for Argentina’s problems, and these are not by any stretch of the imagination new difficulties. The limits to economic growth are, as always, tied to the external accounts, and to the ability to export enough to pay for imports and for the service of external debt. The opposition candidate and his economists—for the most part from the economic teams of the 1990s, when Argentina followed to the letter the policies of the so-called Washington Consensus—suggest that a devaluation of the peso would be the solution. They would complement devaluation with fiscal austerity to control inflation. These are the well-known remedies that the International Monetary Fund (IMF) traditionally pushed in developing countries, with a poor track record. Argentina has a system of foreign exchange controls that limits the ability to buy dollars. That has created a gap between the official exchange rate and the parallel-market rate (known as the “blue”), with the peso around 40% more depreciated in the latter. Eliminating the exchange controls, as Macri has suggested he would do, would lead to a depreciation of at least that magnitude. One could expect at least two immediate consequences: The most immediate one would be an acceleration of inflation, associated to the higher prices of foreign goods. The other would be a recession. The notion is that if inflation increases, on the positive side, the real exchange rate becomes more competitive, since prices go up by less than the nominal exchange rate, and that would lead to a boom in exports. In addition, fiscal contraction would reduce inflationary pressures, which in this view are caused by excessive demand, even though the economy has not been growing fast in the last few years. There is obviously an element of wishful thinking in this view, which is shared by some of Scioli’s advisors, even though in his camp nobody is openly arguing for a maxi-devaluation. 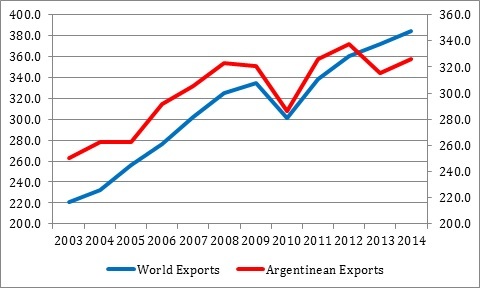 Note that Argentinean exports have grown, over the last decade, along with global exports, which are basically tied to world output. This suggests that exports respond more to the changes in global output than to changes in the exchange rate. More importantly, a devaluation, by increasing the price of imported goods and leading to inflation, would imply lower real wages and lower domestic spending, reinforcing the already weak economy and the likely negative effects of fiscal contraction. The overall outcome of devaluation would be inflation, recession, and a worsening income distribution. And these are in a sense the intended results, since Macri represents a project that in its quintessence wants to restrict the social advances and the higher wages of the last decade. As bad as that seems, I would argue that this would not be the worst effect of a Macri administration for Argentinean society. Over the last 12 years, the role of the military and its relation to the last dictatorship changed in ways that have been unprecedented in the country and in Latin America in general. Not only were the heads of the military junta, who had been jailed in the 1980s and then freed by the neoliberal government of Carlos Menem, brought to justice for different crimes—not the killing of thousands of people, but the kidnapping of the babies of left-wing militants who were killed. But several of the actual enforcers of violence, who claimed that they were just following orders, were brought to justice, too. Also, the organizations that have tried to clarify the past, and find the kidnapped babies, have received significant support. This week, the organization Grandmothers of the Plaza de Mayo announced that grandchild number 118 had been found, 39 years after the assassination of his parents. Macri sees these advances in the pursuit of human rights as vindictiveness, and has explicitly said that, if he wins, the “rip-off in human rights will be over.” In Latin America the history of human rights violations associated to the Cold War era, and the national security doctrine, is gruesome. Most countries, including the United States, that actively supported several of the region’s right wing dictatorships, have not dealt with it. Impunity breeds violence. Forgetting or distorting history creates the conditions for repeating old mistakes. One can only hope that Argentina learns from its past.